Much has changed since 1980 in terms of our growing population, technology, and understanding the connections between water quantity and quality. Indeed, water scarcity can often be the root cause of many water quality challenges, including processed water returned to the environment in a degraded state, groundwater withdrawals without adequate return via recharge, limited sharing of water for ecological flows and purposes, and access to safe drinking water. But thankfully, one thing is clear: The widespread adoption of water conservation across multiple sectors and regions of the United States is working to help preserve our most precious resource for future generations. 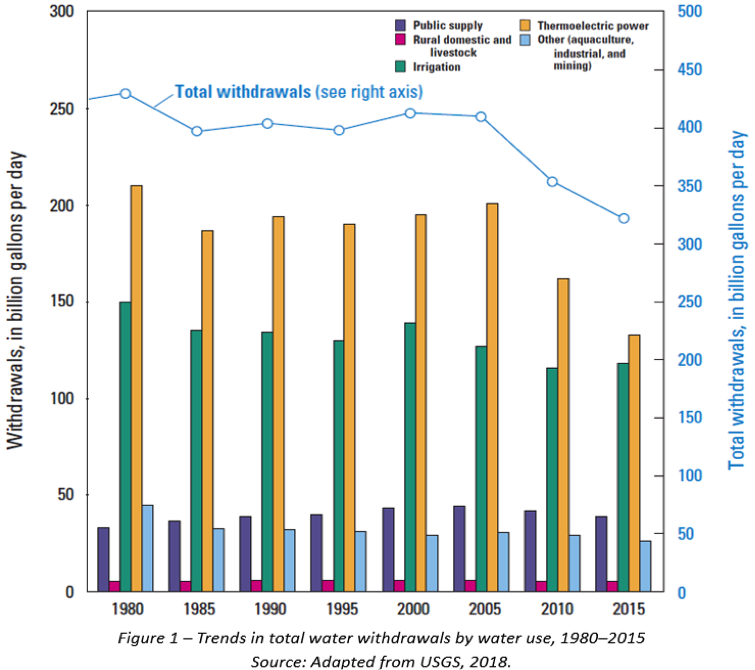 Every 5 years since 1950, USGS has compiled and estimated water use information in cooperation with state, federal, and local agencies, making it possible to evaluate water use trends over time and to support water resource planning at all levels. According the 14th USGS report and most recent data, US total water withdrawals in 2015 were 322 Bgal/day, which were lower than in 1980 (see Figure 1 below) and similar to water use in 1970. Ongoing declines in “self-supplied” industrial withdrawals (now at 5 percent; see Figure 2 below) reflect changes in multiple facets of the US economy, such as a decline in manufacturing, as well as increases in the efficient (re)use and recycling of water within industrial facilities. Withdrawals for all forms of public supply in 2015 were about 12 percent (39.0 Bgal/d) of total US withdrawals.2 In per capita (person) terms, “domestic water use”3 has plummeted from 112 gallons per day in 1980 to just 82 gallons per day in 2015—a 27 percent decrease! “For a typical family of four that means about a half-ton of water saved, or eight cubic feet, every single day relative to 1980.”4 However, domestic water uses vary considerably by region (e.g., arid west) and at the state level, ranging from a low of 35 gallons per day in Connecticut to a high of 184 gallons in Idaho. 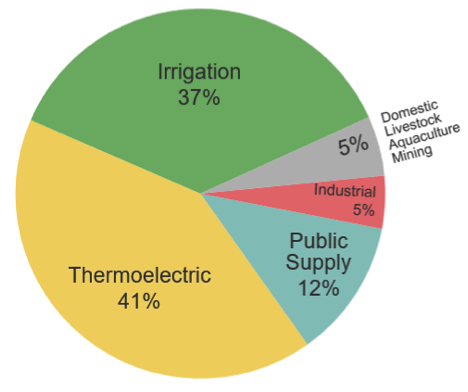 It’s worth emphasizing that domestic water use accounts for just a tiny fraction of overall US water consumption, about 1 percent.5 Thermoelectric power (e.g., steam-driven electric turbines) accounts for 41 percent of all US water use, although this water is mostly returned to the environment (only 3 percent lost through consumptive use). Also, these withdrawals have declined by almost 18 percent since 2010 because of increased efficiency and closures of power plants. Withdrawals for irrigation grew by 2 percent since 2015 to 37 percent—despite record-setting droughts in California, which remains the biggest consumer of water for irrigation and for overall water use (9 percent of total withdrawals) in the United States. Moreover, over half of the water used for irrigation is not readily available for another use as it is incorporated into crops or lost to evapo-transpiration. Figure 2 – Portion of US water withdrawals in 2015 Source: https://owi.usgs.gov/vizlab/water-use-15. 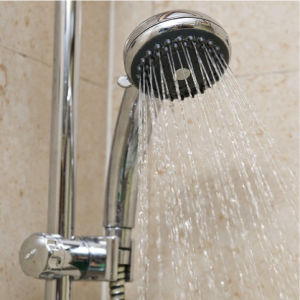 USGS credits a variety of federal policy interventions with reducing domestic water use. One major one is the National Energy Policy Act of 1992, which established efficiency standards for now ubiquitous low-flow toilets (1.6 gallons per flush), bathroom faucets (2.2 gallons per minute at 60 psi), and shower heads (2.5 gallons per minute at 80 psi). Notably, that legislation passed with overwhelming bipartisan support, while 2005 amendments improved efficiencies for high water use appliances like dishwashers and washing machines. But Americans are acting locally and impacting water use nationally by choosing to take shorter (low-flow) showers; turning off the tap while shaving or brushing teeth; and, in some places, moving away from traditional grass-covered yards to alternative, water-smart landscaping, for starters. While our average per capita home water use is declining, despite a steadily rising population, it still remains much higher than that in other developed nations like the United Kingdom (37 gallons per day) and Germany (32 gallons). This is in part because US water remains very cheap relative to other countries, but this may change in the years to come, and impose additional water challenges and lifestyle changes. So while I may begrudge low-flow showers on occasion, and sometimes miss washing my car in the driveway, it is comforting to know these and other, sometimes mandated, water conservation choices and activities can and do make a difference. 1 Dieter et al. 2018. Estimated Use of Water in the United States in 2015: US Geological Survey Circular 1441. https://pubs.usgs.gov/circ/1441/circ1441.pdf. 2 Per USGS (Dieter et al.) 2018: Water withdrawn by public and private water suppliers that furnish water to at least 25 people or have a minimum of 15 connections. Public supply withdrawals are delivered to customers for diverse domestic, commercial, and industrial needs. Part of the total is used for public services, such as public pools, firefighting, and water and wastewater treatment, while some is unaccounted for because of leaks, flushing, and other system losses. 3 Per USGS (Dieter et al.) 2018: Domestic water use includes indoor and outdoor uses at residences, and is either self-supplied (e.g., by a private well) or provided by public suppliers. Common indoor water uses are drinking, washing clothes, bathing, and flushing toilets; common outdoor uses are watering lawns and gardens or maintaining residential pools. 5 USGS (Dieter et al.) 2018.